Lance Factor, George Appleton Lawrence Distinguished Service Professor of Philosophy, discusses the significance of literary societies in the building of Alumni Hall. The third and final cornerstone-laying was for the Gnothautii cornerstone. Check out the first and second ones. Sounds like it wasn’t quite as cool as the Adelphi ceremony. Members and friends of Gnothautii got together on a Wednesday morning to lay the mottled red granite stone, which bears a simple inscription: “Gnothautii. Founded 1848.” They filled an empty space within the stone — what we’d now call a time capsule — with several items. Among them: an account of Gnothautii’s founding, its constitution and by-laws, a list of members from the founding, a list of present officers, and newspapers. The cornerstone was laid by Knox Professor Milton Comstock, an 1851 Knox grad and one of Gnothautii’s original founders. He taught mathematics, philosophy, and astronomy, and he also was a noted horticulturalist. Comstock was part of “The Great Triumvirate,” a name given to three distinguished scholars (Comstock, Albert Hurd, and George Churchill) who formed the core of the Knox faculty in the second half of the 19th century. Comstock delivered remarks, and he was followed by J. A. McKenzie, a Gnothautii and a lawyer in Knox County. McKenzie made his speech without using notes. Milton Comstock, left, Albert Hurd, right, and George Churchill were The Great Triumvirate of Knox College in the late 1800s. First, a quick reminder that Alumni Hall originally was built as three structures: Gnothautii in the east wing, Alumni Hall in the middle, and Adelphi in the west wing. Three cornerstones were laid in separate ceremonies. We’ve already mentioned one of these, when President Benjamin Harrison came to Knox for the Alumni Hall cornerstone ceremony. 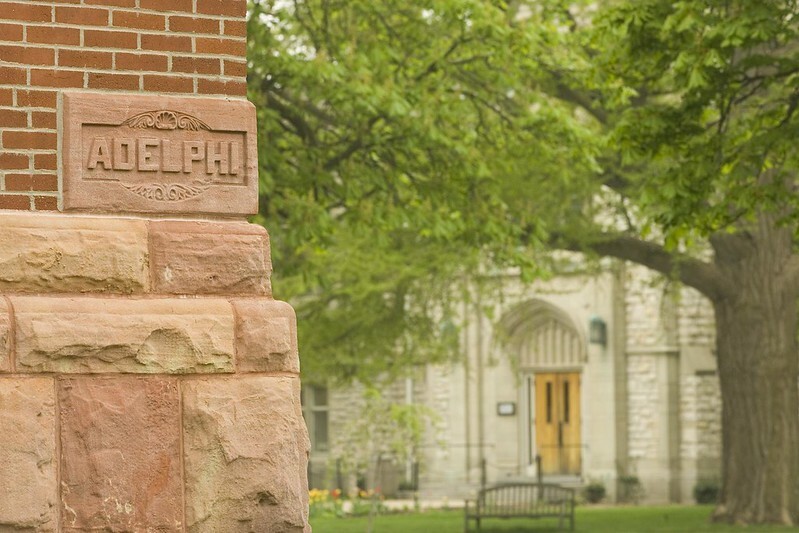 Today, we look back at the laying of the Adelphi stone. There was no U.S. president at this ceremony, but still, it wasn’t exactly low-key. There was a large procession of people that included Knox President Newton Bateman and other dignitaries riding in a four-wheeled carriage, soldiers from Battery D, the Marine Band, and men from the Adelphi literary society. The newspaper Coup d’Etat described the scene this way: “The procession moved around the Courthouse Square and on reaching the Seminary [modern-day Whiting Hall], the boys fell back to give the place to the L.M.I. girls who, having been previously invited, attended in full. There were sixty of them.” L.M.I. — Ladies’ Mutual Improvement Society — was a women’s literary society on campus. Once the procession reached the Knox campus, buglers played, a prayer was recited, and an Adelphi quartet crooned a welcome song. The Adelphi president introduced George Appleton Lawrence, an 1875 Knox grad who became a respected lawyer, financier, and Knox trustee for more than 40 years. “An auspicious day has dawned for the old Adelphi,” he said. Then he grabbed a trowel, placed it in the mortar, and adjusted a tin box with various mementos, including the Adelphi Constitution, a list of members’ names, and the Adelphi bell. Other highlights of the ceremony included a 10-round cannon salute, remarks from 1885 Knox graduate H. Mark Gilbert, a performance of the Adelphi song, and, finally, a whole lot of cheering. There were three cheers for Knox, three for the L.M.I., three for Gnothautii, and three for Adelphi. You probably heard about President Barack Obama’s recent appearance at Knox, but he isn’t the only sitting U.S. president to ever set foot on campus. 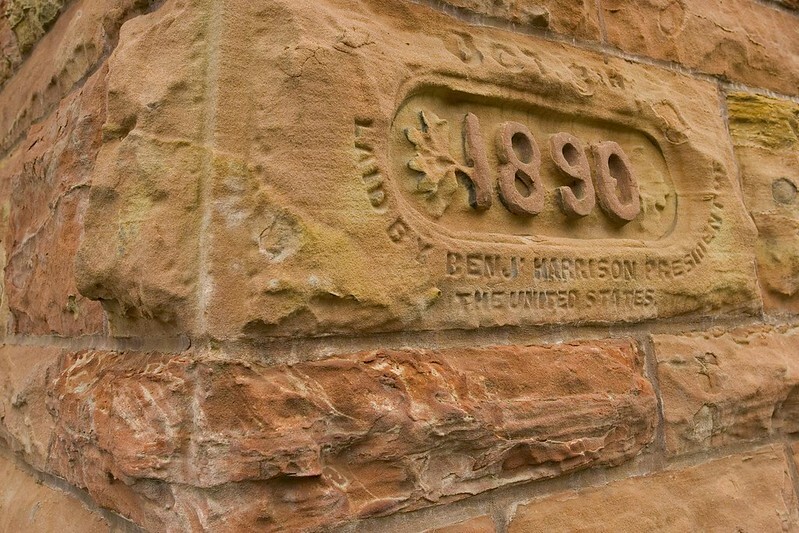 Did you know that President Benjamin Harrison was here in 1890 to lay the cornerstone for Alumni Hall? At least, he laid one of its three cornerstones. What we know today as Alumni Hall originally was three separate buildings. Each got a cornerstone and a cornerstone-laying ceremony. Alumni Hall actually is just the middle part of the structure. The west wing is Adelphi, and the east wing is Gnothautii — both names of men’s literary societies on campus. The societies helped pay for the construction of what we now call Alumni Hall. The three parts of the building (Adelphi, Alumni Hall, and Gnothautii) were completely separate, and you couldn’t get from one to the other unless you stepped outside. Harrison laid the Alumni Hall cornerstone on October 8, 1890, and a tremendous group of veterans, Knox students and faculty, Galesburg residents, and other folks showed up. In all, the crowd numbered about 10,000!